But this “new” schedule still raises some questions. One of the driving forces behind the change to the current schedule was the incorporation of Physical Education into the curriculum. With P.E. becoming a requirement as either a semester-long elective course or a year-long choice block, students are finding themselves making tough decisions. Is a semester block worth as much as choice block, and what will colleges think? The impact of this change on year-long organized choice blocks like The Innovator and Student Government remains to be seen. Will this new schedule limit the amount of course offerings each semester? This was also a benefit of the current system, since students were able to choose from a greater variety of classes. Emails have been sent to the school community since the original announcement that have cleared up some of the confusion, but some are still unsure of how this switch will affect them personally. On Friday, February 26, Dr. Arnold gave three separate presentations centered on explaining the next year’s Program of Studies to freshman, sophomores, and juniors. English teacher Ryan Deery laid out the options for the English department, while Beth Olesen and Kara DeBaun did the same for their respective subject areas, History and Math. Arnold focused especially on one of the more unique aspects of the 2016-2017 Program: Dual Enrollment. Through a special (but as of yet not fully approved) agreement with Middlesex Community College (MCC), IACS is offering the opportunity for students to earn both high school and transferrable college credits on campus by having certain teachers granted adjunct faculty status. This is hugely beneficial for students as they will not have to commute to the MCC campus for classes. Specific eligibility requirements to participate in Dual Enrollment can be found on the Program of Studies document. These in-school presentations, while they caused some frustration by taking up parts of D, E, and Choice blocks during the day, were essential in clarifying the extensively detailed Program of Studies. 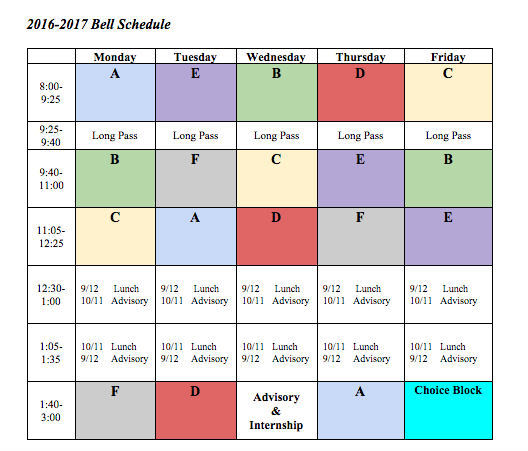 While the confusion and mixed emotions that have arisen in the wake of the announcement of the new bell schedule are all justified, it is important to remember that some similar confusion had come about as a result of last year’s announcement of this year’s schedule system. Even more important is that many of the concerns now are nearly the opposite of those from last year, which may indicate that one of the most seemingly difficult changes in the school may not be so difficult after all. Next Next post: Snow… in March?